After four years of discussions in and around the Human Rights Council about improving the body’s efficiency, discussions that have culminated, over the past ten months, in intensive Bureau-led negotiations to secure agreement on a meaningful (though still rather modest) set of reform measures; States are now entering the final stretch, with the contours of a deal clearly discernible in front of them. But will delegations seize the moment and support the Bureau’s sensible proposals? Much depends on the answer to that question. If States agree on a strong set of efficiency reforms, it will clear the way for the Council to focus, over the next few years, on effectiveness reforms (e.g. implementation, impact, prevention, item 10 reform), as well as on preparations for the 2021 review of the Council’s status. If States fail to reach agreement on even these modest changes to the way the Council works, then it would send a very negative message about the body’s ability to keep its own ‘house in order,’ and would undermine its authority and credibility in the eyes of the wider international community. Against this background of opportunities and risks, tomorrow (15 November) States and NGOs will gather for a fourth round of open informal consultations on a package of measures put forward by the Council President, Vojislav Šuc. The President’s overall proposals, based on year-long consultations led by three sets of co-facilitators (Spain, Philippines, Rwanda, Chile, Fiji and Latvia) – which can be read in full here – cover the body’s programme of work, the rationalisation of initiatives, and the mobilisation of information technology. The rationalisation of general debates throughout the year, so that there would be two dedicated general debates per year for each Council agenda item (instead of three, as now) – supplemented by ‘human rights general debates’ that would cluster a number of agenda items in one debate. The Bureau estimates this simple and modest step would save up to 15 hours of Council meeting time per year – time that could be spent promoting Council ‘effectiveness’ measures, following-up on implementation, and recognising State progress. Produce a structured, logical, transparent and predictable three-year programme of work, so that the Council’s work is properly organised over time, duplication is reduced, and States have greater certainty about what will be covered during each regular session. The Council to present and adopt an updated three-year programme of work during an annual organisational/planning/exchange of information/pledging meeting to be held each December. Encourage the target of a maximum of ten two-hour panel debates per year. Encourage the further biennialisation and triennialisation of resolutions (building on the progress made in this area over the past four years). The adoption of an improved, more comprehensive, and more regularly updated annual calendar of initiatives. Finally, the draft proposals urge States to agree on a range of steps, in the short-, medium-, and long-term, to use information/modern technology to make the Council easier to engage with (e.g. easier access to speakers’ lists, draft resolutions, an improved Extranet, online calendar of events – including side events) and participate in (e.g. possibility to sign up to speakers lists, upload statements and table/sponsor draft resolutions, on-line). The proposals would also improve transparency by, for example, maintaining updated lists of State delegations to the Council and NGOs (voluntary). In the longer term, the Bureau proposes making all such features available via a mobile application (app) for the Council. As Council members consider these proposals, it is important to bear in mind something Joachim Rücker, the ninth President of the Council, would regularly remind colleagues of in the context of his own efficiency drive in 2015. Namely, that the aim of such reforms is not to reduce the work of diplomats, or to save time for the sake of it. Rather, it is to reduce repetition and duplication, and create more space on the Council’s agenda for meaningful dialogue and cooperation, in furtherance of human rights around the world. In other words: improved efficiency is a crucial prerequisite for improved effectiveness and on-the-ground impact. Feature image: President of the Council, H.E. 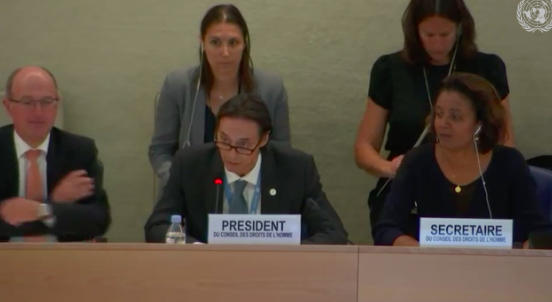 Mr. Vojislav Šuc, chairs the organisational meeting of the 39th Session of the Human Rights Council. Screenshot from UN Web TV.